Simon Callaghan’s long-standing interest in English music has led to recordings of music by Delius, Sterndale Bennett, Parry and others. The figure of Roger Sacheverell Coke, however, remains mysterious. After a 2015 disc of solo piano works was welcomed with critical praise and wider renown, the pianist and director of music at London’s Conway Hall redoubled his researches, focusing on the public library in Chesterfield where the greater part of Coke’s scores and papers are archived. The fruits of his labour are released next week on Hyperion, as part of the label’s long-running series of Romantic Piano Concertos (this is Volume 73). With the help of the British music specialist Gareth Vaughan, Callaghan turned up full scores for the Third and Fourth concertos, as well as a slow movement that was destined for an incompleted Fifth. Many hours of labour ensued on the part of Callaghan and others, turning the manuscripts into performable parts, before the intriguing, individual voice of an eccentric Romantic could be heard once again. 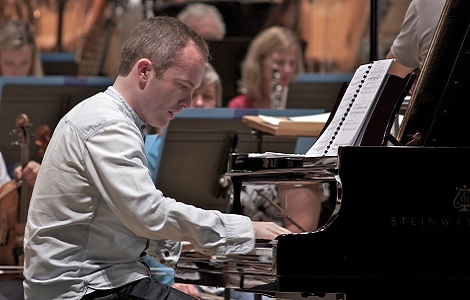 Callaghan is pictured above at the recording sessions in Glasgow (© Oscar Torres) with the BBC Scottish Symphony Orchestra conducted by Martyn Brabbins. Born to a well-to-do Derbyshire family in 1912, Coke (pronounced Cook) went to Eton and became a pianist of some accomplishment who made several broadcasts for the BBC during the 1930s. However, he spent most of his time at the family’s ancestral home, and retreated ever farther into solitude as periods of mental illness became longer and more severe. He died in 1972 having burnt through the family inheritance. Coke’s surviving family believe that the composer suffered a breakdown in his mental state, between completing the Third in 1938 and the Fourth three years later. Callaghan believes that ‘A composer’s personality is always reflected in the music that they write’ – and this breakdown is written into the fabric of the Fourth. ‘It starts out like the beginning of Rach 3, but goes into a much more adventurous chromatic language, even further than Scriabin, but sometimes returns to a very rhapsodic language. The instability comes through in his music. There are three cello sonatas which the pianist is presently working on with a view to performances and recording. Eighty-odd songs are waiting in the archive for modern revival. There are a couple of trios, a violin sonata and viola sonata, orchestral pieces, even an opera (performed by the London Symphony Orchestra in 1958 and conducted by Sir Eugene Goossens) but Coke’s voice is primarily a pianistic one, and it has a worthy advocate in Callaghan.